Taking a circuitous route via an early incarnation as a Latin American and Ballroom junior UK champion, Katy re-engaged with dance after a detour into journalism and arts marketing. After receiving 1st Class BA Hons in Humanities, Katy worked as a community publishing editor and trainer before gaining a scholarship to study for a Post Grad Diploma in Printing and Publishing Studies at LCP. A brief foray into journalism saw her write for The Guardian, I-D Magazine, Time Out, Rough Guides, Wales on Sunday and BBC Radio 5 before realising that there is only one Julie Burchill. Katy keeps a toe in editorial work by editing and design of a bi-monthly voluntary sector newsletter and occasional freelance copywriting. Katy undertook Marketing, Publicity and Information contracts for Arnolfini, St Pauls Carnival, Avon Community Arts Network, Viz Arts & People, Brighton & Hove City Council, Kuumba Afrikan Caribbean Arts Centre, Bristol Area Dance Agency (BADA), Afrikan Caribbean Artists’ Forum (ACAF) and Evaluation Reporting for Arts Council’s Education Action Zone, gaining a C.I.M. Diploma in Marketing and studying for an M.A. in Social Research from Goldsmiths along the way. Taking a contract to co-ordinate a weekly young people’s dance session at Kuumba, Katy developed a three year business model and programme which was successfully funded by ACE, delivering a thriving programme of youth and community engagement, artist training, visiting artist residencies and professional performance programme. The dance bug had bitten back. Joining Dance Bristol, Katy undertook an Action Research role; developing a successful ACE funding bid for Kinesis, Bristol schools’ youth dance company, managing a visiting artists’ programme and developing youth performance opportunities across the city, including the popular ‘Hip City’ mentoring and performance platform which aimed to develop skills and aspiration amongst street dance and hip hop crews and build bridges between those crews and the wider dance sector. Developing work in Arts and Wellbeing, Katy managed a programme of dance for elders in the city in partnership with the City Council, as well as city-wide Big Dance initiatives, a BFI funded film commission and advising artists and groups on fundraising applications and strategy. Moving to Bristol City Council, Katy managed the Gallery 37 plus Creative Apprenticeship programme, offering skills training and pathways to over a hundred NEET young people, including Arts Awards Level Two Accreditation and Sports UKs Dance Leadership accreditation, building partnerships with S Glos Dance and Council Sports Departments. Having built income generating partnerships with Youth Dance England, Bristol Public Heath Directorate and The Schools’ Sports Partnership, Katy’s contract was extended as ‘Dance and Creative Learning Officer’. This saw the first incarnation of ReStaged – an urban dance programme that engaged with over 400 children and young people, providing pathways from engagement to accreditation and performance. Generating a time of tangible growth in Bristol’s youth dance sector, ReStaged was instrumental in supporting both Champloo Youth Dance and Rise Youth Dance Company, both of which secured places at YDE’s national flagship event U Dance. Youth dance in Bristol was on the national map. Katy produced YDE’s Regional U Dance event in Bristol, the annual ReStaged Platform featuring gust artists such as Jukebox and Plague at Colston Hall and the YDA Satellite with Swindon Dance. With the Arts Team she co-managed Wlli Dorner’s Bodies in Urban Spaces, Luke Jerram‘s ‘Play Me’ and InBetween Time‘s Still Image Moving as large scale city wide commissioned projects. 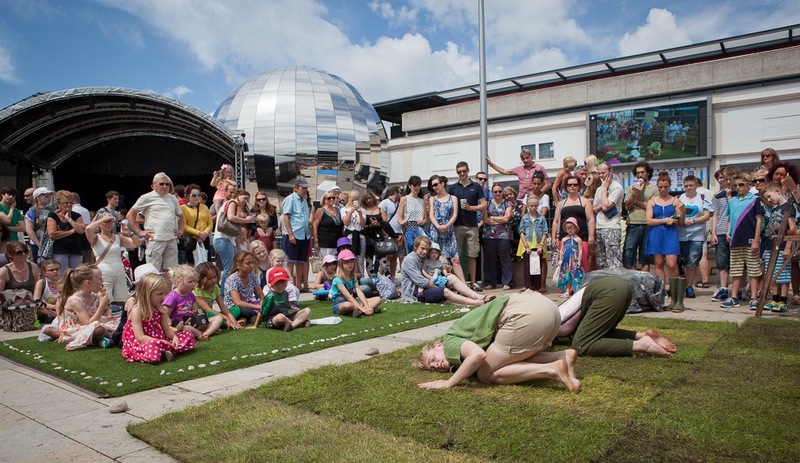 As a member of Bristol Dance Steering Group, Katy was instrumental in developing the business case and funding for the post of Creative Producer for Dance at Theatre Bristol, an Associate Artist Programme with venues across the city, bringing Breakin Convention to Bristol and overseeing the growth of Bristol Harbour Festival’s Dance Stage into a two day ‘Dance Village’.